While traditionally flagstones are set in a bed of compacted sand and gravel over raw dirt, they can also be installed on top of an existing concrete surface. Mortar is required to bind the flagstones to the concrete, and depending on your personal preferences for stone and height, you have different options to create the best mortar bed for your installation. Mortar requirements for laying flagstone over concrete depend on the stone. Rectified flagstones are those that have been machine-tooled to a regulated thickness and size. 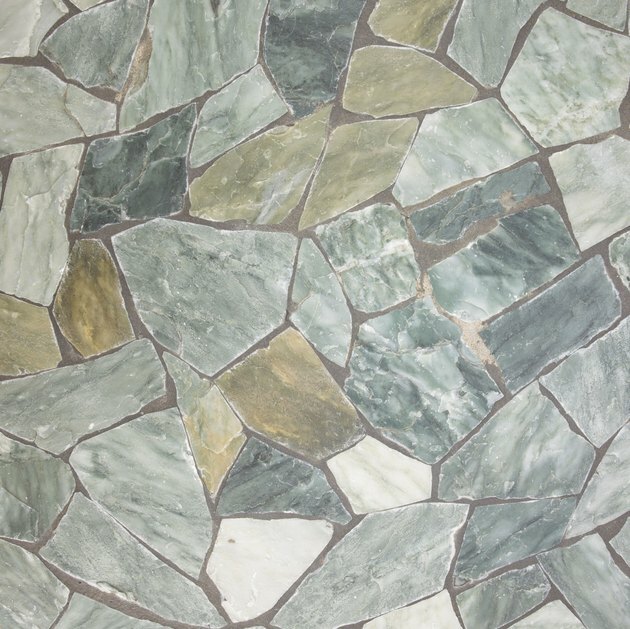 These are the easiest type of flagstones to use, as they install similarly to ceramic tile. Since they are uniformly sized, you can spread an even layer of thinset mortar on top of the concrete and install the flagstones like tiles. Traditional flagstones are varied in thickness, width and size. They are more difficult to install than regulated flagstone, and require significantly more physical effort. You cannot use normal thinset mortar with natural flagstones because of their varied thickness, which means a bed of sand and concrete is required to cushion the stones and leave the finished surface uniform and flat. Thinset mortar is the same type of mortar that is used in traditional ceramic tile installations. It is a combination of sand, cement and polymers. You can trowel it on using a notched trowel with a size that is dependent on the size of the flagstone with which you are working. Large-bodied stones such as flagstone generally require a minimum trowel notch of 1/2-inch, which provides sufficient mortar for the flagstone to use as a bed. For natural flagstones that are varied in thickness and size, you need to use a cement and sand bed. Rather than a creamy mixture such as with thinset mortar, a cement bed of mortar is a mixture of sand, cement and lime that you layer on top of the cement. The flagstones are then pressed into the mixture and tapped into place with a rubber mallet, with each individual piece pressed into the mixture at a different depth to achieve a flat surface across the entire flagstone installation.